We know how retirement is supposed to go: You spend 40 or more years working, and then, hopefully after saving enough money, you retire from the working world in one grand finale. But what if you could instead take several breaks throughout your career? What if, after working 10 years, you decided to take a year off and return to a full-time job later? What if you decided to do the same thing all over again 10 years later? 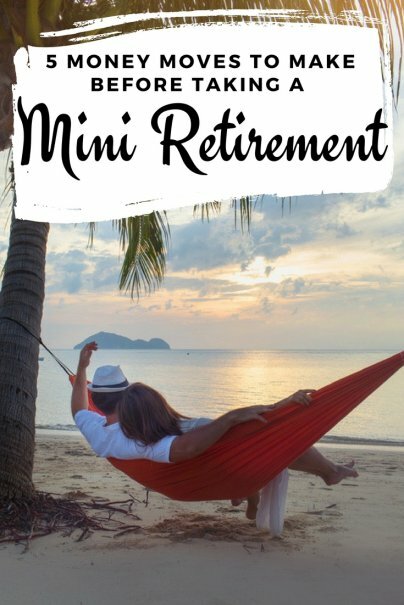 That's the idea behind the mini retirement, a small but growing trend among people who don't want to wait until their senior years to pursue goals or just relax, away from work, in a way you can't during weekends or short vacations. You can do anything you want during these miniature retirement periods: travel the world, spend more time with your kids, start an online business, or pursue a hobby. And when the mini retirement ends, you return to work full-time, either at the company you left or a new one. A mini retirement is similar to a sabbatical, but sabbaticals tend to be one-off breaks, whereas mini retirements are intended to recur throughout your career. A mini retirement may also be used to explore other career paths and make a transition, while a sabbatical often involves going back to the same job you left. Taking a mini retirement comes with many benefits, but if you're not prepared, it can also put a strain on your financial stability. Here are five money moves you need to make before embarking on a mini retirement of your own. To get an idea of whether a mini retirement is even feasible, you'll need to figure out how much money you'd spend during your break from work. This means factoring in the costs of travel if your plans include taking a long trip. It means considering the cost of health insurance, which you will probably have to pay for on your own once you leave your full-time job. And, of course, it means budgeting for everything from your monthly mortgage payment, to your children's education, to the weekly groceries. Whatever you do, don't embark on your mini retirement without first determining how much money you'll be spending during it. Once you have an idea of how much you'll need for your mini retirement, you'll need to start stashing money away for it. Depending on your income and your mini-retirement budget, this could take several years. For instance, if you think you'll need $40,000 during your mini retirement, you could plan to save $10,000 a year for four years. A mini retirement can help rejuvenate you during your working days, but it will also change your financial strategy for your final retirement. If you aren't earning a full-time salary for a year or more, your retirement savings simply won't grow as quickly. You'll have to be realistic about what steps you'll have to take so that you will be financially ready for your final retirement. This might mean saving more money each year. Or it might mean pushing your final retirement back a year or two. You'll have to determine how the pain of taking those steps compares to the benefits you'll receive from a mini retirement. You don't want to enter a mini retirement burdened with high amounts of credit card debt. It will be much more difficult to pay down this debt if you're not earning a steady income from work. So, before you leave your job for your break, get that credit card debt down to zero. While you're at it, clear as many of your other debts as you can, too. You probably won't be able to pay off your mortgage loan, but you might be able to pay off your car loan. Any debt that you can eliminate before taking a mini retirement will help make the transition away from a full-time salary easier. You might have big plans for your mini retirement. But remember, big plans often cost big money. Be realistic about how much you can spend while taking your break from work. The more you spend, the more difficult your transition will be.